Situated in the heart of the Balkan Peninsula, Bulgaria boasts a long and rich history. Thracians, Greeks, Romans, Byzantines, Slavs and Bulgarians inhabited this land in their time, leaving behind monuments and enriching this treasure trove of culture. The geographical position of Bulgaria, on the crossroads between Europe and Asia, is reflected in the rich and ancient history of Bulgarian culture, architecture, cuisine, customs and traditions. Sofia is the capital and largest city of Bulgaria. The city is at the foot of Vitosha Mountain in the western part of the country. Being in the center of the Balkan Peninsula, it is midway between the Black Sea and the Adriatic Sea. Being Bulgaria's primate city, Sofia is a hometown of many of the major local universities, cultural institutions and commercial companies. Sofia is one of the top 10 best places for start-up business in the world, especially in information technologies. Sofia has been an area of human habitation since at least 7000 BC. Through the centuries, many nations have inhabited it and added to its rich and diverse history. Numerous Neolithic villages have been discovered in the area, while a chalocolithic settlement has been recently discovered in the very centre of modern Sofia. Unlike many Central and Eastern European capital cities, all of Sofia's sights aren't compacted into a tiny Old Town, but spread out throughout this large and vibrant capital, waiting to be found. The city of over 1,250,000 people has a long and turbulent history that adds to the complexities of its current layout. Luckily, most sights can be found in the city centre, and good public transportation within the city makes it easy to get around. 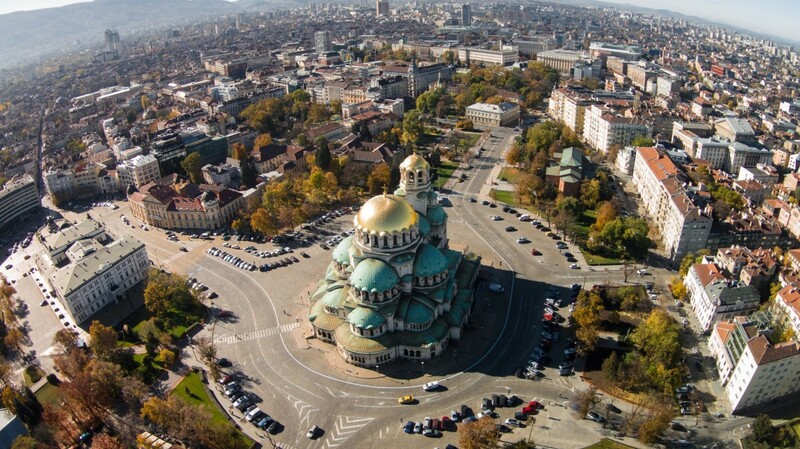 Some of the main attractions you won't want to miss are Sofia's cathedrals. Sofia's long history of Eastern Orthodoxy has left behind impressive and beautiful cathedrals, some dating back to the 10th century. Among those not to be missed include the massive Alexander Nevski Cathedral - a structure so gigantic we really doubt you could miss it anyway. Within its Neo-Byzantine exterior, the beautiful central dome has the Lord's Prayer inscribed around it with thin gold letters. The 10th century Boyana Church, a UNESCO World Heritage site, can be found further out in the Boyana district, while right in the centre of the city (ironically situated in the courtyard of the Sheraton Sofia Hotel) stands the Church of St. George, a late Roman church dating back to the 4th century. And one shouldn't miss the early Byzantine Church of St. Sophia, the very one that gave the city its name. But if museums are more your style, Sofia's got hidden treasures all over the map. Notably, the National Historical Museum, the Bulgarian Natural History Museum, the Museum of Earth and Men, the Ethnographic Museum, the National Museum of Military History, the National Polytechnical Museum and the National Archaeological Museum all draw crowds throughout the year. Art lovers will want to explore every crevice of the Bulgarian National Gallery of Arts, as well as checking out the Sofia City Art Gallery and the Bulgarian National Gallery for Foreign Art. Many private galleries can also be found throughout the city. History fans should be thrilled to discover that St. Cyril and Methodius National Library was named after the inventors of the Cyrillic alphabet, and houses the largest national book collection, as well as being Bulgaria's oldest cultural institute.